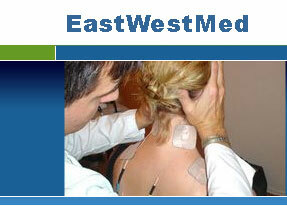 Eastwestmed - Acutron offers the most versatile and advanced Eastwestmed therapy available. Offered through pad, interferential, and probe techniques. Classic Interferential - For acute pain in the low back and other large regions of the body. Micro-Interferential (5 preset options) - Subacute and chronic pain relief for large regions of the body, such as the hips, knees, shoulders and low back. Excellent with simultaneous exercise and/or myofascial release for rehabilitation after surgery or injuries. Russian Stimulation - Commonly used in sports medicine practices. Using Acutron Mentor is so easy. Simply choose from a menu of powerful preset pain control protocols with the touch of a button, OK it, and start treatment. Or customize any settings if you want. The choice is up to you. It's really that simple! Offers 19 preset treatment protocols that address the needs of the whole gamut of patient conditions - for hypersensitive chronic pain patients to acute analgesic treatments. You can create up to 21 additional presets as well. RS-232 jack in rear hooks up to external PC for unlimited applications. 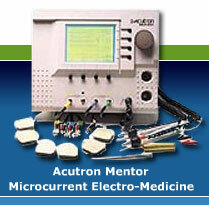 The Acutron Mentor does not just offer these separate protocols. It's innovative combination therapy presets use treatment sequencing to enhance effectiveness, reduce accomodation, and reduce the pain rebound effect often experienced with other stimulators. click the different parts of the picture to learn more about it. Offers 19 preset treatment protocols that address the needs of the whole gamut of patient conditions - for hypersensitive chronic pain patients to acute analgesic treatments. You can create up to 21 additional presets as well. RS-232 jack in rear hooks up to external PC for unlimited applications. Ease of set-up and use: Acutron "Quick Keys" allow instant access to your three most commonly used presets, with no set-up time at all! The other presets can be accessed within seconds. You can use the presets as is, or modify any parameter at any time. Gentle "cool down" period following all milliamp (high intensity) treatments to prevent pain rebound effect. Utilizes real time operating system via high level C language. Output channels are microprocessor controlled with A-D converters and Mosfet outputs. Total available memory 128K. 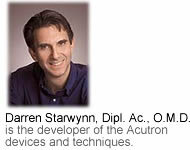 The innovative software in the Acutron Mentor was designed by a long-time expert in the Eastwestmed field. With 19 powerful presets utilizing 6 distinct waveforms, 6 modulations, separate channel frequencies and other options, the Acutron offers far more versatility than any other unit on the market. Software can easily be upgraded to future releases. 97530 Therapeutic Activities - for physical therapies that enhance strength, gait and range of motion. Results of such treatments can be significantly enhanced with simultaneous Eastwestmed interferential stimulation Note- When probe and pad treatments are used sequentially in the same treatment session, it is appropriate to bill two CPT codes for the two blocks of time. EASE OF USE - Acutron preset treatment protocols significantly reduce set-up and training times, thus reducing personnel costs. FOUR INDEPENDENT AND ISOLATED OUTPUT CHANNELS - Gives flexibility to provide several different modalities or to treat multiple patients at the same time. MANAGED CARE BENEFITS - Faster healing and rehabilitation of patients helps provider deliver results with reduced treatment sessions and resources, a vital advantage in managed care systems. INCREASED NEW PATIENT REFERRALS - Effective and rapid pain relief generates dozens of patient referrals. 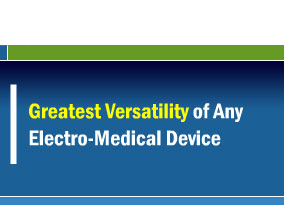 Most doctors using the Acutron Mentor consider this its most important economic benefit. GENTLE TREATMENT- Eastwestmed treatment appeals to elderly, sensitive and chronic pain patients, and is ideal for infants and children. Acupuncturists can also attract needle-phobic patients by offering Acutron electro-therapy as an alternative to needle treatment.